Greetings all, what a wonderful site for steam discussions! I have an old house that had steam installed in the 1920s. One half of the House was built in the 1790’s the rest in the 1910-1920s (when steam was installed). Nat gas, low pressure, one pipe steam. I bought the home two months ago and noted it was taking on way too much make up water. It’s a13 year older Burnham IN6, and it has failed. 175,000 btu input, correctly sized based on my EDR measurements 425sq ftradiation on a mix of different styles of tube and column rads). Digital water feed meter claims 4 gallons a day.....(Ugh!). I could not locate any steam or water leaks any where. (Unless a slow one hiding under insulation, or an enclosed wall leak, wet return not buried, all visible). Took off the cover and found a hole rusted through the top of the steam box. (Ugh, see picture). This explains all that extra smoke/steam coming up my (lined) chimney compared to my neighbors... My understanding, it can’t be welded. (Ugh!). My near boiler piping may have contributed. 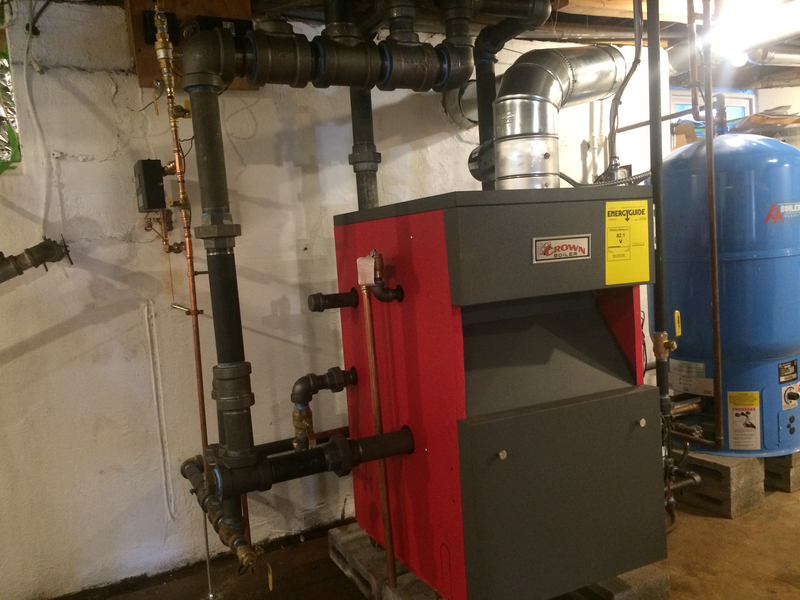 There is no swivel joint atop the boiler. 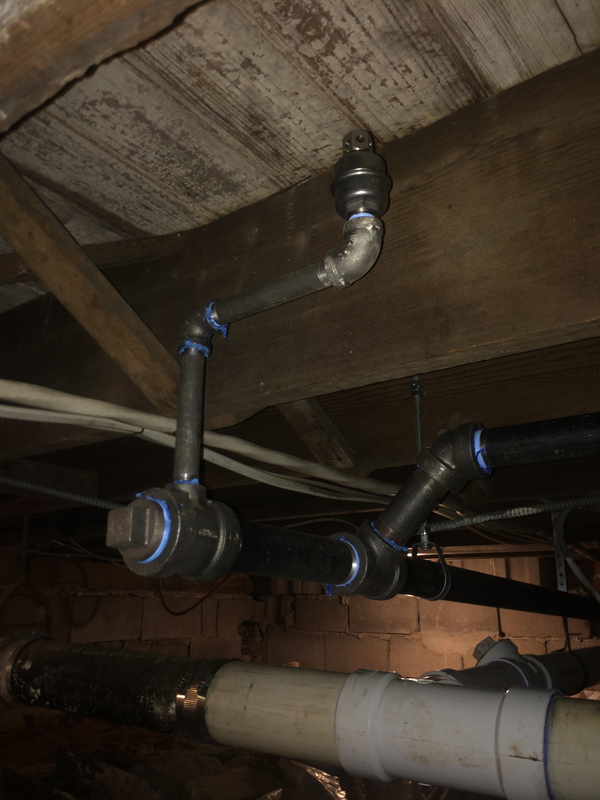 Pipe runs linked to the near return without a swivel.... steam exit pipe then runs up to a bull T into the middle of a mains pipe that runs across the middle of the basement. Slopes up on one side of T and down on other side of the T. So, it appears to be bi-directional on one side of the mains (steam and return) and unidirectional on the other side of the T (steam an return going same direction. Very little hammer that I have heard. Wet return is all copper, rest is iron pipe, presumably post WWI, possibly pre WWI (~1910). System has no mains venting, only rad venting. Need these added to improve trim. Having difficulty finding a good steam guy in my area (near Hopewell NJ 08534). 2 HVAC guys I brought in thus far seem Not experienced in steam. I think all I need to have done is replace the boiler and repair and replace the near piping (with proper swivel this time). 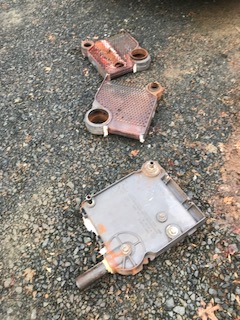 Maybe get a new amtrol tank while in the process and tap or tee off two new main vents....(need to calculate proper size). Picture of hole attached for your viewing pleasure. Although a bit outside our service area, Gateway Plumbing and Heating could install the boiler for you. If you haven't found someone already, I'd be happy to give you a proposal for the work. See if you can find out what the chlorides level is in your area, they can attack cast iron. The piping is not good but it's not terrible because the second tapping wasn't tied into the header so the stress on the boiler was probably not an issue. When you do replace I would use the second tapping and perhaps go for a dropped header as well. This image shows how it should be piped. 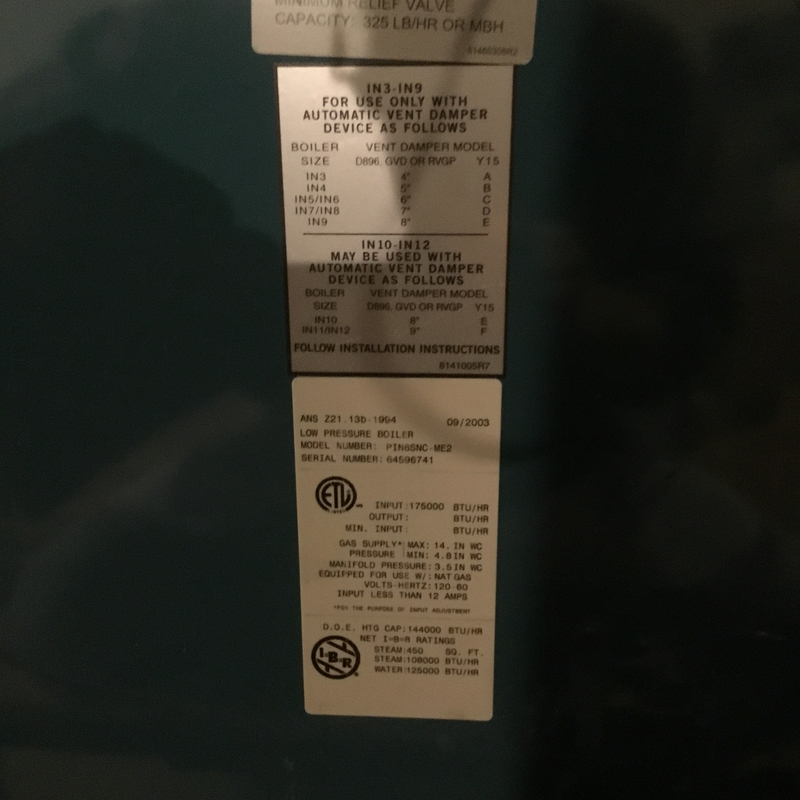 There are some very good installers in NJ, use the find a contractor link on this site and let them install whatever boiler they are comfortable with. You are much more calm than I would be, that boiler failed on the previous owner. Hard to imagine they didn't know that. That corrosion didn't happen in 2 months, IMHO. Ahhh... yes I see, withjust the single tap and not a double tap off the boiler to the header there really is not much thermal expansion to stress the boiler sections. 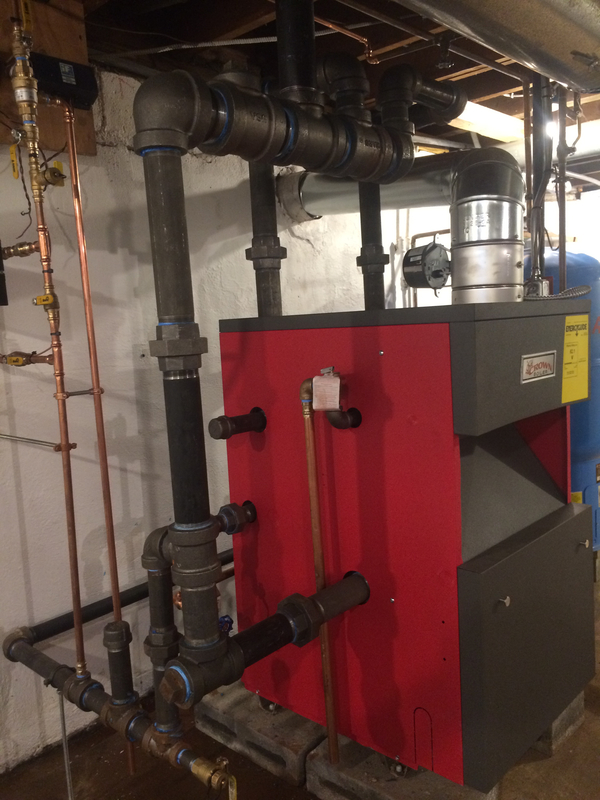 If we go with Two lines off the header on this 175k btu we would would allow for more efficient heat transfer out of the boiler.... makes sense to me. When you describe “drop header” you mean the drawing inside the dotted line ? Yes, I am sure this hole was in the works for some time. Can’t be new. My text may be calm... however.... I have additional thoughts...... I am not sure I have much leverage on the seller to remediate. I Should have inspected MUCH more closely. It made heat in the first few minutes to all but one radiator (stuck valve) and had no water leaks visible. I spent more time inspecting the chimney and flue liner. That’s in excellent shape. A dropped header (shown inside dotted line) insures nice dry steam that transfers heat very well. It costs a little more but will save fuel and improve your comfort. 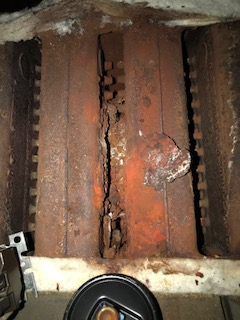 Ask any installer if he can suggest how to make sure a new boiler last more than 13 years. EzztT has posted pictures of his work here, you won't go wrong using him. Both John, and Ezzy are top notch steam pros. One point to consider is the distance of each from you for any future service calls. Was there a house inspector involved in the sale? If so he may some liability in overlooking this. 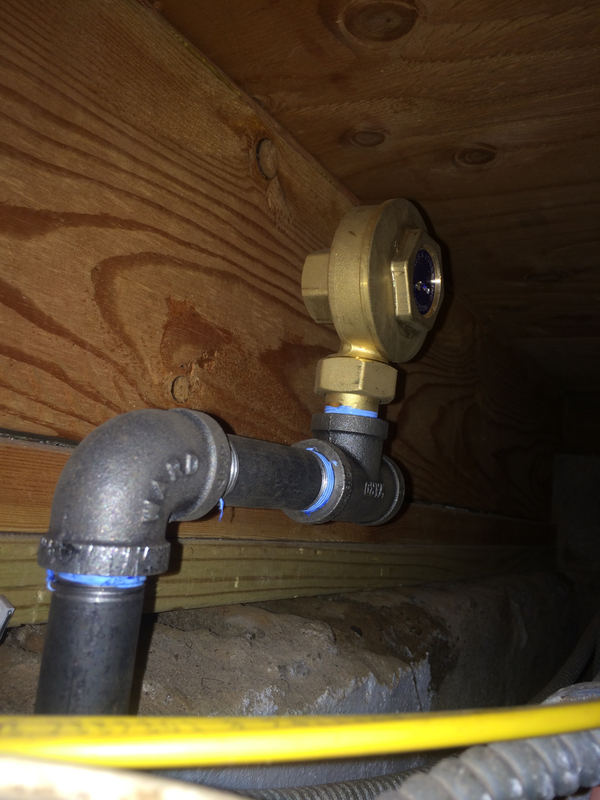 Access any data from the water meter, and maybe it would be able to give you its date of installation, and previous use of water, although I don’t know if they are that capable. 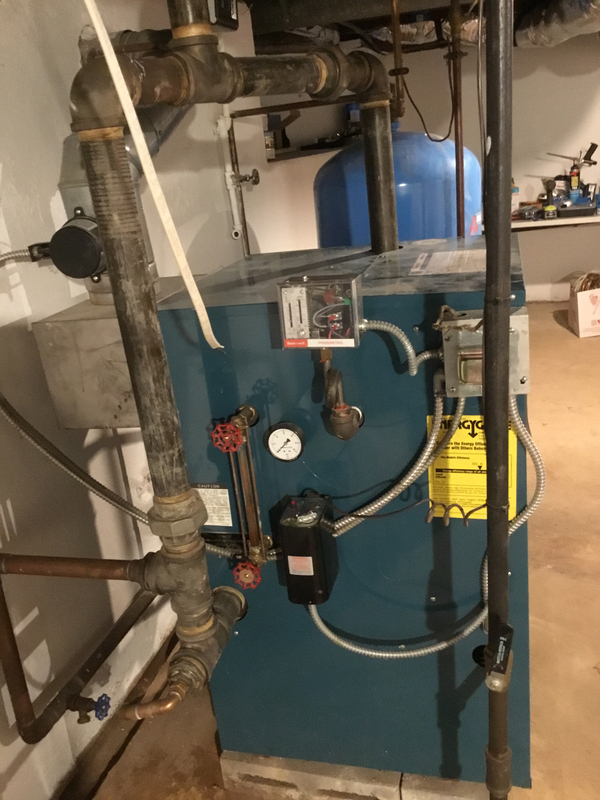 Contact @Dave0176 he repiped my boiler and installed a hot water loop for my basement. He did excellent work. Can't go wrong with any of the three mentioned. Thanks guys. My husband had a local guy out last night who said he had experience with steam. He wanted to rebuild all the near pipes in copper. Holohan and pretty much everywhere else we look this is a clear no-no for longevity and strength. We will not be using that fellow. The system was serviced by the oil service company here. Princeton fuel oil in September. 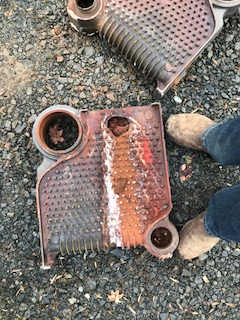 They must have not opened the top if the exhaust cover to brush and vacuum or they would have seen this. As it is natural gas, perhaps such brushing is not standard every year as it would be with oil. But I think they would have seen the problem if they probed the exhaust gas yes? Should I fire the maintenance service and seek a new one??? By now you know more than the guy who showed up and suggested a copper header. and I would guess all the previous service people. Keep looking. The guys mentioned above are expert. For the time being you could try cleaning off the rotten portion of that section and patching it. A heavy duty epoxy putty should lower your water use and buy you some time. Just a thought. In the past, I've made some strong field-expedient patches using the following method. 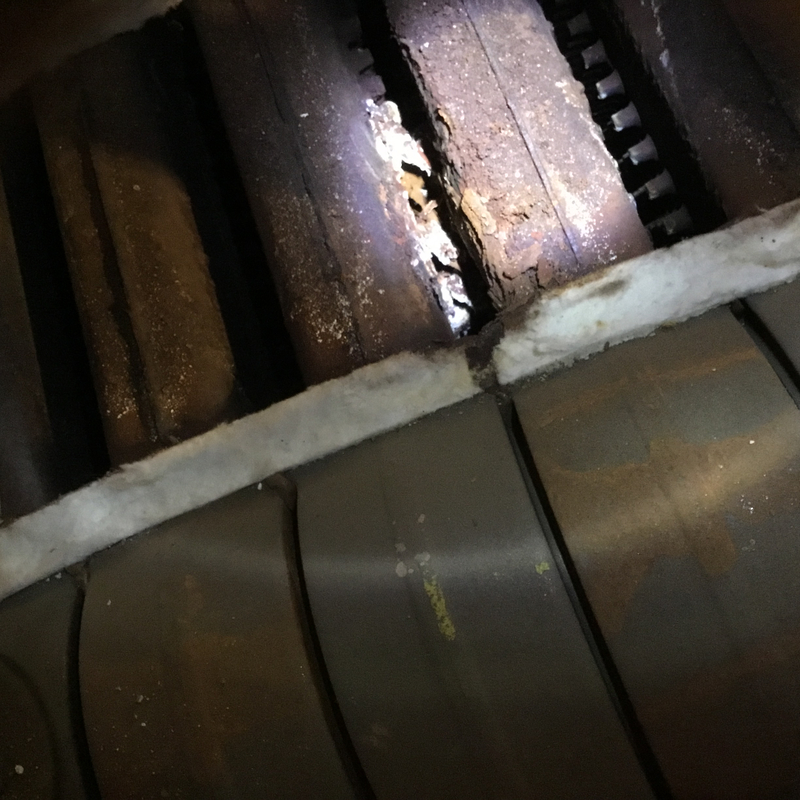 After the surrounding areas are cleaned using a wire brush or equivalent, mix and dabble some J-B Weld (#8265S) around the edges, then press a trimmed section of fiberglass mesh tape over the hole. The mesh tape I use is found in the drywall section. Put some more of the JB weld around the perimeter so it encases the fiberglass tape. 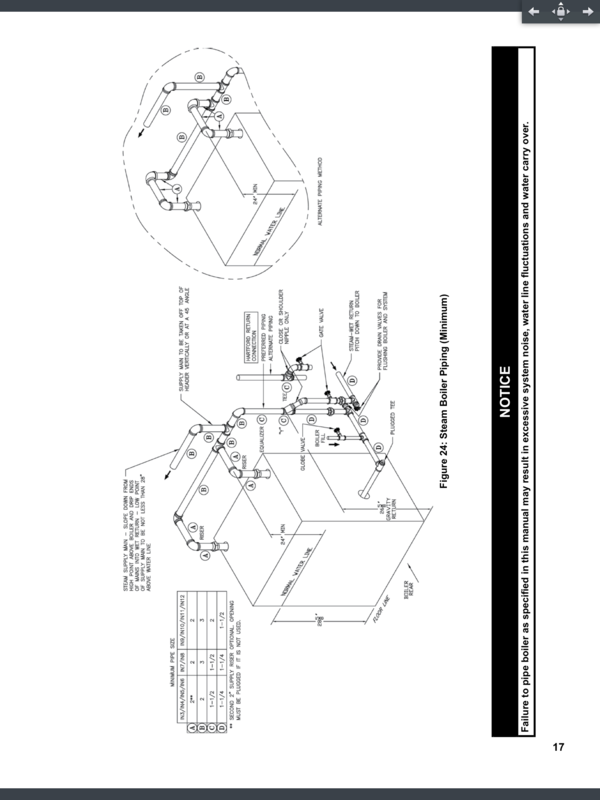 In lieu of the fiberglass tape, you could also use sections of stiff wire (stainless tie wire). Let cure overnight. Once cured, mix up a high heat epoxy putty stick (J-B Weld 8297) and press it into the fiberglass tape and past the edges to act as the patch. Due to the rough surface of cast iron, the epoxy/fiberglass may adhere well enough to make a strong and long lasting fix. In this case, it only needs to limp along until your upcoming replacement. Hey great idea! That might give me a wee bit of time while we arrange the replacement. Thank you for the materials list and JB weld part #'s you like. The heavy weight 3M sanding grids used for drywall might prove a good and rough substrate for the bond as well. they are fiberglass underneath. Well, we have lined up EzzyT and his team for the work next week. A great explainer. My husband learned a great deal talking with him about our existing system. Will post some photos of the new drop header when complete. 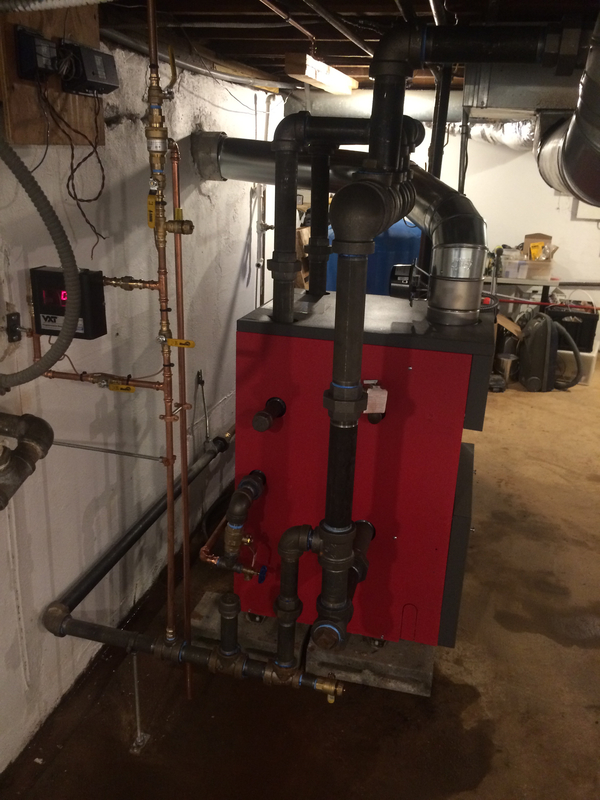 Here is the new boiler, piping and main vents upgrade. 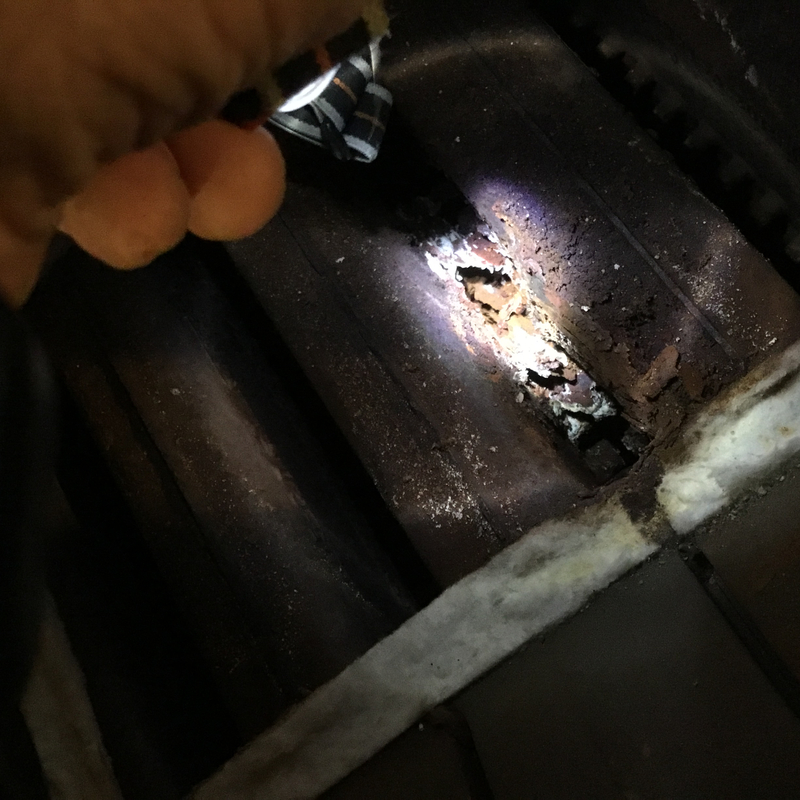 Old boiler had a significant sized hole above the water line as the homeowner had mentioned before. 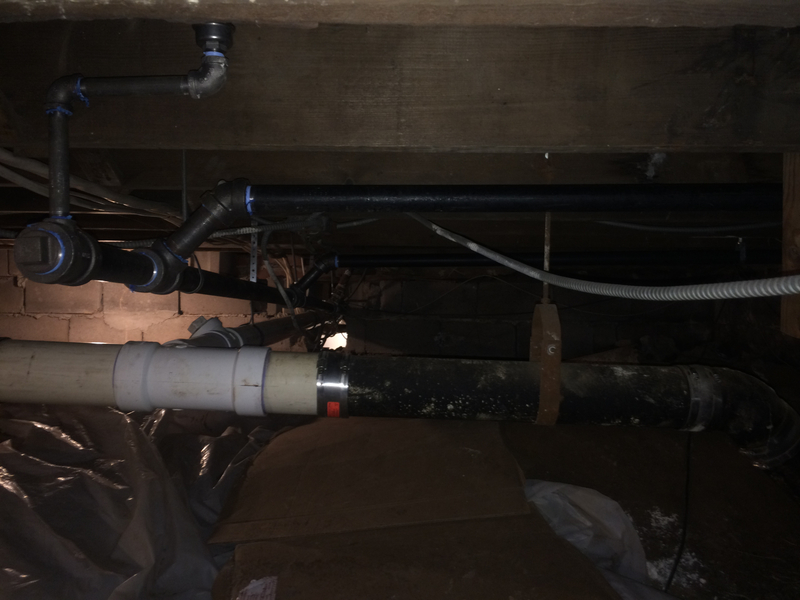 There is a 11/2” counterflow main that branches off at the ends of a 2” parallel flow main that runs into a crawl space feeding 3 radiator risers. We replaced a section of the 11/2” steam main along with the last 2 radiator risers. (Picture isn’t clear). Skimmed and wanded the Boiler after install but will be back to skim and wand some more. have to love the look of a job well done!! Well, last week we had Ezzy and his team from E.Travis Mechanical replaced our Failed 13 yr old Burnham 175K IN6. He and his team were great: punctual, friendly, informative and very well humored. The guys clearly worked well together as a team. They answered all my questions and made me a good bit smarter by the end of the project. 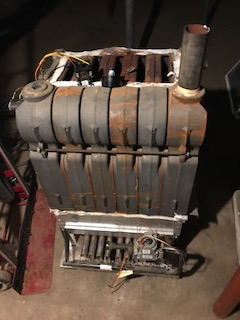 They pulled the old Burnham unit and replaced it with a much improved near pipe design (all USA made iron) with a drop header one size larger and a new Crown boiler unit. There is an extra tee in the drop header to accommodate a future split of my existing mains w/drip line if/when needed (existing Mains has a bull Tee). 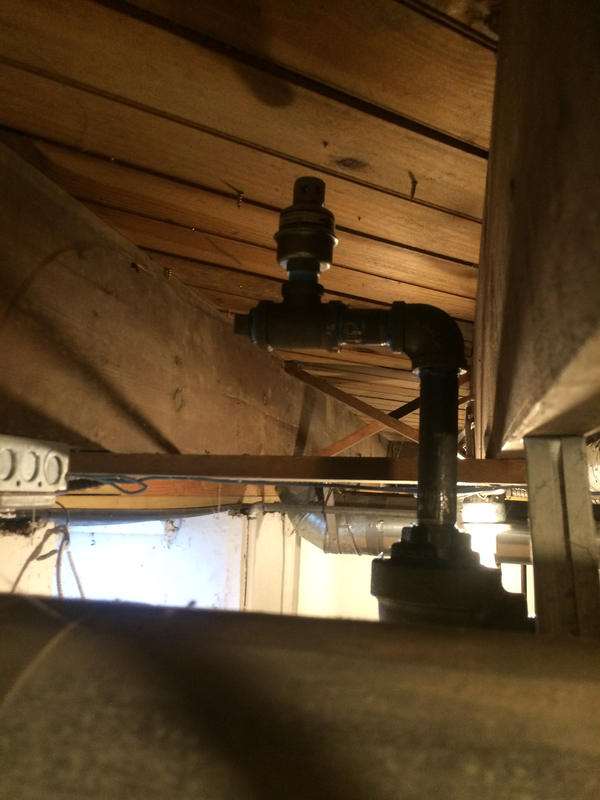 They also replaced the piping and risers to three rads in a crawlspace that were an old mishmash of copper and galvanized. Also, our previous install had no Mains vents, it only breathed through the rads. They corrected this as well. 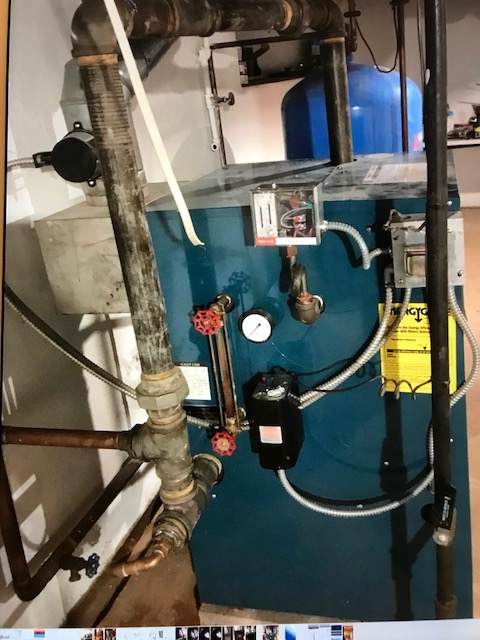 I am very pleased to report that after a week with the new system, the water hammer /knocking that used to occur with the prior arrangement has completely vanished. The nice, dry steam provided by the near pipe design improvements has made the system as quiet as a mouse. Just the gentle hiss of air from the vents.... Well done friends! I do wonder though... what number furnace is this for the house? improved pipe design by Ezzy and team. I include some pics below that show: the old Burham IN6, same with blue skin removed, view of steambox rust hole (above water line) before and after the sandwich was broken down. Note that unit was spewing 5 gallons of raw water steam up the (SS-lined) chimney every day. 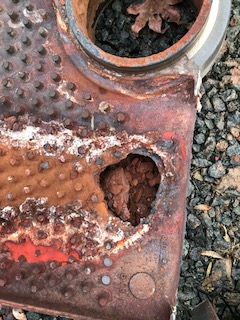 To be clear, the hole shown in the picture is a little bit enlarged from picking at it to see where the end of the hole and beginnings of the crumbly rust edges were. Thanks Ezzy and team for a job well done!! !